It’s been 1 week since our team has started building out the features for the game. We spent well over 200 hours between the 6 of us this week alone on only about half of our total features. All in all, it was a pretty busy week. I worked on both the character walk/run along with the camera logic. The controls are a little complicated but they don’t take long to get used to. 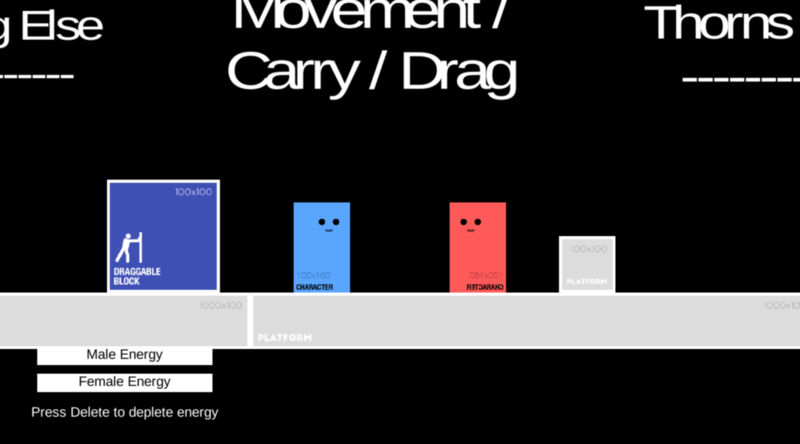 WASD Movement Moves the male character in the direction the player is pressing at walk speed. If the player holds the male’s interact button while moving the character will run. Space Bar Jump The male character will jump vertically. Left Shift Interact Activates several different actions depending on the male character’s current state. For example, dragging a crate or climbing a vine. Arrow Keys Movement Moves the female character in the direction the player is pressing at walk speed. If the player holds the female’s interact button while moving the character will run. Numpad 0 or ‘/’ Jump The female character will jump vertically. Right Shift Interact Activates several different actions depending on the female character’s current state. For example, dragging a crate or climbing a vine.